Just like they advocate to not go to the supermarket with an empty stomach, I highly recommend not to pin when you have not eaten anything but cheese and soup for five days straight. I started to get cravings for everything – bananas, corn, seafood, sweet, sour, soups, stews – I was out of control and all over the place. One of the things that I gravitated towards was soup and stews – it has been crazy cold here in Florida and nothing but a hot bowl of soup or stew was going to cure those winter blues. Today was the first day that I felt almost human. I was still feeling congested and stuffy, but, not as bad as the last five days - and I was hungry, which is a good sign. So I went hunting in the refrigerator for inspiration. And I found all the ingredients for this Corn chowder. This soup is inspired by a combination of various pins – I loved everything about it. 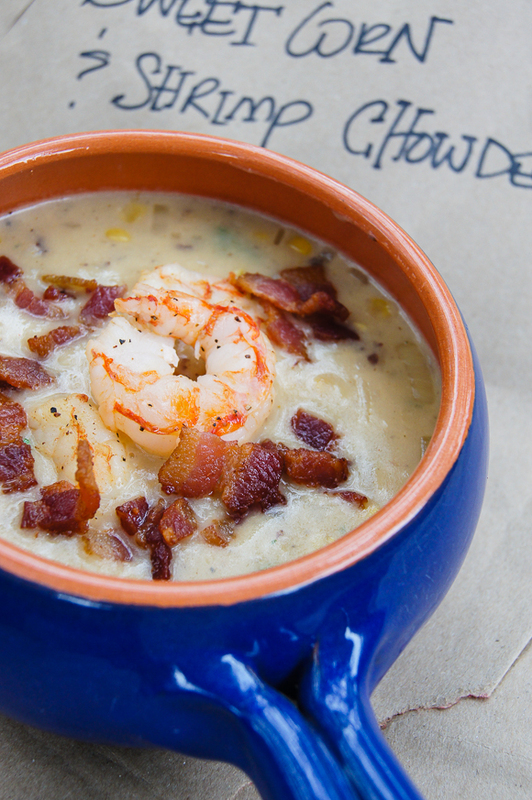 Corn chowder is one of my favorite soups and if I could eat shrimp everyday I would. And don’t get me started with what to do with bacon. Putting it all together was a nice little slice of cooking heaven. 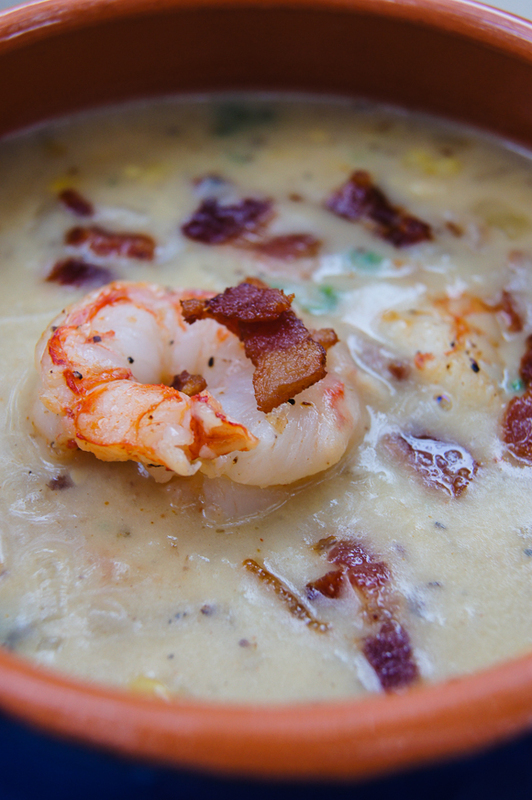 The end results yield a creamy soup, with sweet corn as the star and the curry and cayenne pepper playing off the delicate shrimp giving it some heat. The crispy bacon was just the encore on the dish. Add the bacon and cook rendering the fat. Cook until you get crisp bacon bits - then bring forth all effort to NOT SNACK on those crispy morsels - when you remove them from the fire with a slotted spoon to a paper towel lined plate to drain. Remove some of the fat until about 2 tablespoons are left in the pot. Add shrimp to the pot and season with salt and pepper, cook for 2 minutes in the bacon fat. Stir to cook shrimp evenly, do not overcook! You want them a bit undercooked - remember you will be adding them to your final cook chowder and they will continue to cook in the hot soup. Remove shrimp with a slotted spoon and set aside.